Light the Tiki torches and break out the Hawaiian leis! 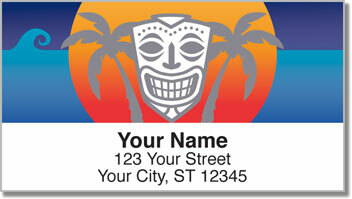 Now you can give your outgoing mail the look of a lively island party when you choose this fun-filled set of return address labels! Each of the prints features a brilliant sunset, palm trees and traditional masks often used in ceremonies and celebrations on tropical islands. It's an amusing way to stick a little personality on those dull white envelopes and boring brown paper packages. 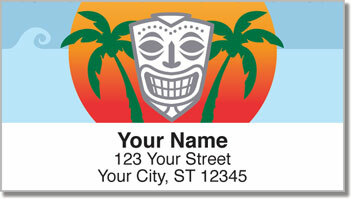 Tribal Mask Address Labels from CheckAdvantage are also a convenient, time-saving tool. Why scribble out your name and address when you can simply peel and place them on anything that goes in your mailbox? 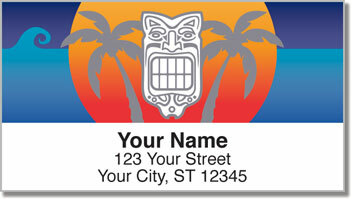 Get your very own Tribal Mask Address Labels today! Add matching personal checks to complete your order.